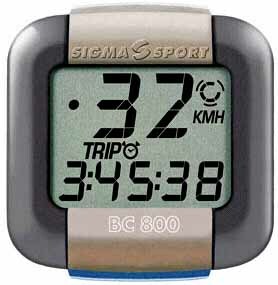 All speeds mentioned are measured using a Sigma BC800 - which is a bike computer which you can fit on yours. It can measure your average speed, The instantaneous speed, the maximum speed, trip distance, time etc. The RD speedo, or any other analog speedo available around here, maintains a steady error which begins to grow real messy once you talk of speeds more than 100kmphr. Hence the Sigma. This is where i got it from. The price comes to around 1000 rs without shipping. Fundamentally it has a sensor which picks up magnetic activity, a magnet which provides activity to be picked up, and a CPU which works on the inputs provided by the sensor. Now the sensor needs to go on the front fork; Very near to where it joins the wheel center. And the sensor should be faced such that it faces the wheel hub; And the thin magnet provided, it should be fixed on the hub such that every time the wheel rotates, the magnet flashes past the sensor and cuts it once. Installation is not very complicated as long as you have not lost the magnets supplied along with the complete package. If you try to beat a magnet out of some speaker then you might have a tough time getting the sensor to read the magnet. The Sigma needs to be fed the circumference on the front wheel; Normally for the RD, it is safe to use something near 1985 mm. Now the sigma knows how much the bike would have travelled between two magnet interrupts. And on measuring the time took, it can find out the speed.